리마, 페루의 디오스마 베드 & 브렉퍼스트 | 호스텔월드에서 예약하세요. D'Osma Bed & Breakfast is a friendly guesthouse located in Barranco district, Lima. We are an accommodation with family-style service. We have only five rooms and a maximum occupancy of 10 people. This allows us to give a warm personal touch to the service we offer, which makes our Bed & Breakfast one of your best alternatives. We set ourselves apart through the personalized service we offer. Your comfort and well-being are essential to us, and in our accommodation you will find security for yourself and your belongings. All this in one of Lima’s best locations. There is a 24-hour front desk and we can offer different other services like: taxi service, laundry service, bike rental, snacks. We also have information about the city and tours. 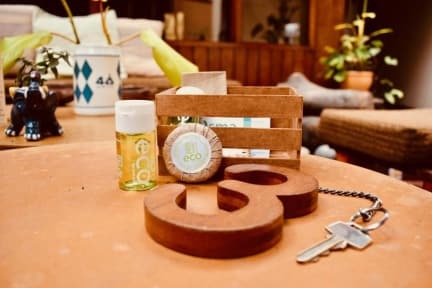 We are located in Barranco, one of the best neighbourhoods for cultural and bohemian lifestyle in Lima.Located in the south of the province of Lima, the capital of Peru, in the north it borders with Miraflores, the tourist/commercial district, and in the east with the coast of Lima. Its exceptional location means its landscapes and sunsets are unbeatable. This small district boasts many contemporary art galleries as well as some unusual museums/exhibition galleries and meeting places such as cafes, pubs and discos. The main park is 2 blocks. The Pedro de Osma Museum is only 2 blocks too. The beach is 5-8 minutes walking distance. D'Osma Bed & Breakfast offers comfortable private rooms. All are private rooms, with cable-TV, internet Wi-Fi, fan, night table. 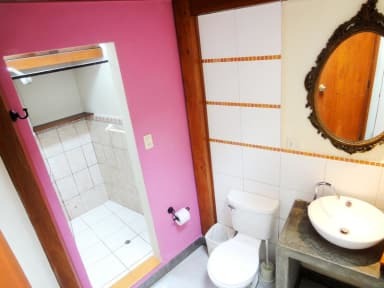 One room has shared bathroom. All rooms have private bathrooms with hot water and some mini fridge. The national sales tax (18%) is charged upon check-out to citizens of Peru regardless of length of stay and to foreigners staying in the country for 60 consecutive days or more. Foreigners who present a valid passport and Andean Migration Card (Tarjeta Andina de Migración) at check-in are exempt from this tax. Furthermore, the tax may apply per room when the room is shared by a taxable and a nontaxable guest.